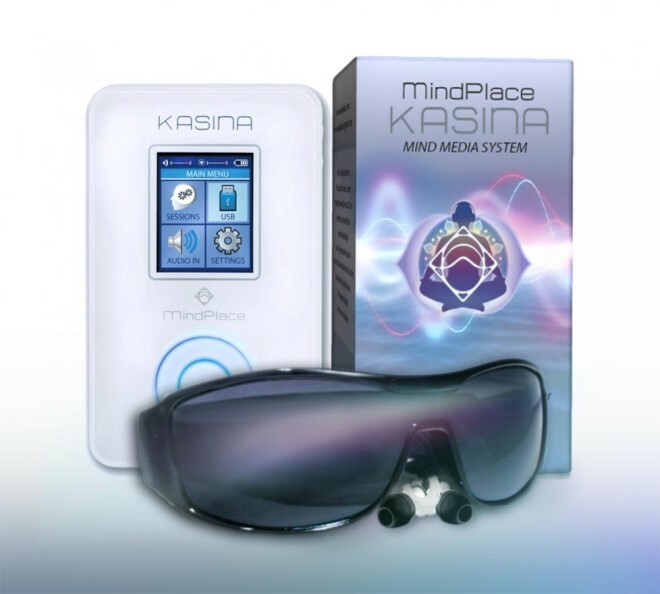 The great people at MindPlace (http://www.mindplace.com) have been very kind to provide me with a Kasina Mind Media System in order to review it. With that said, I’m going to put it through its paces over the next little while and provide you all with a blow by blow rundown of it! To start, I’ll mention that this is my first light and sound machine that I’ve ever used. The cost of this particular AVS system is $350 directly from their website, or you can also order it on other sites including Amazon. That makes this machine really easy to attain. This is everything that’s included in the box. There’s the Kasina itself, in the middle. The glasses above it (very stylish!). The earbuds, which I have found to be very good as they fit nicely into the ear to provide such a seal that it’s almost like noise cancellation (but isn’t, just thought I’d point that out). It comes with an 8gb card, pre-loaded with A LOT of programs for you to use right out of the box, and you’re able to download more or write your own with software they provide. The rest constitutes the quick start up guide (very handy! ), and all equipment you need to charge and run the device and a sweet little pouch to hold it all in when you’re not using it or when travelling! Very nice. This image makes up the bulk of the actual machine itself. It’s very similar to an iPod/iPhone in size and scope, but it’s about double as thick. It’s very light with a very strong, plastic construction, but it’s completely solid and I’d be very confident using this as a straight up MP3 player on the road or working out with. The software and controls make it very easy to navigate through the menus to find the program you want to run. The operating system/software which runs on the Kasina is very well programmed. The menus are very intuitive and are really easy to navigate. The first program I decided upon after running through the lists quickly was called “Forest and River”, which has a run time of 16 minutes. I sat down on my trusty recliner couch, made myself comfortable and loaded’er up! The “Forest and River” program started… the light combinations, the pulsing and how everything mixes together was truly astounding. After not even a minute into the program I was being whisked away to a beautiful forest, where all the rivers/trees/animals/etc were there, in my mind… and when I say “whisked away”, I mean it figuratively AND literally. It started off with a fast pulsing of blues and greens, then slowed down bringing me even more deeply into the scene which was being generated in front of me. I even briefly had images of trees pop in front of me (the literal part! )… meaning that, for brief seconds, I actually was “there”, in the forest. In projection practices, we call these hypnogogic images. Then as the program was wrapping up, it would speed up the pulsing and bring you ‘back’ to normal, waking consciousness, kind of like the gateway tracks do. I kind of wished that one was longer. The value of this machine to meditation practices is really amazing and I’m really looking forward to delving deeper into what it offers, but I can truly see the value of this machine as an aid to Projecting. Using this before bed, or even first thing in the morning, can really put the mind in the correct mindset to have many projections. Anyway, that’s my initial impression of the Kasina. It’s a high quality machine, no doubt about that. I’m extremely impressed so far. I’ll be adding to this thread as I experiment more with it. I plan on making this a regular part of my meditation/projection practices in the future. It was suggested to me by Lionheart, a moderator over on the Astral Pulse forum. This was a 25 minute session, which really shows the basics of what the device can do. It takes you through several shifts, auditory and visual. The sound it uses is an isochronic beat, which generally don’t do well for me, but this mixed with the light really makes a difference! The strobe-effect creates an extremely vivid sense of movment down a tunnel being taken in various directions! They speed you up, slow you down, and toss a variety of colours into the mix to get your senses. In projection practice, the sense of movement really helps trigger the projection-reflex. So this kind of program will really assist with that. The next day I found I had 20 minutes to spare so I tried the “before learning” program, which is a 12 minute program. I don’t know about the stated effect of making you more receptive to learning, but I did find it very relaxing anyway. It made me very receptive to dropping off into a non-physical lucid awareness experience. I’m finding that I like the programs that provide a sense of movement then rapidly changes that sense to a new direction. Really focuses my mind. I also need to further check their support forum for downloadable programs. A couple days later I had a lot more time so I downloaded a program which Lionheart used on his Laxman. It’s one that neuroasis (one of the MindPlace customer service reps, REALLY nice and REALLY helpful people) was kind enough to convert to the Kasina. As a side note, it’s REALLY easy to download programs and load them on the device. It works exactly like a USB Flash Drive. You just open the downloaded zip, and place the files within in either it’s own folder or another folder on the device. So simple! Love it! I loaded up the 30 minute L#3 program, kicked the recliner couch back and enjoyed the binaurals and lightshow! It’s very similar to the binarual I made a couple years back, with some differences. But where the program really kicked in was with the lights. The Binaurals are one thing that really help with your focus, but the lights bring a whole new layer of focus and kinds of melts your attention into the patterns you’re seeing. It also kind of feels like your eyes are still open too, since you’re ‘seeing’ so much. Another nice benefit which I’m noticing from this machine is that while using it, my eyes seem to be locked shut. Once those colours start firing my eyes are locked, can’t open them until it’s over. One thing I would like to see, and I’m not sure if the options in the device can be set for this, is for the lights at the end of a program to slowly dim down until they’re off. The quick shut off is rather abrupt. Other than that, this machine has been a pleasure to use. I’m seeing now that the LED lights bring a whole new layer to the mix of mind entrainment. It’s kind of like the 3D Blackness, yet it begins from the very get go and provides plenty to visually focus on. It’s like binaurals for the eyes! The more you focus on what you’re seeing, the further within and the deeper you’ll go into the non-physical. Next, I plan on trying my hand at using the Basic Editor software which comes with the Kasina to make my own program! I used the Kasina Basic Editor to create a short 10 minute program which kind of mimics a binaural beat I made a while ago using a different program. I was also playing with all the settings and seeing what everything did. Pretty good basic program. It doesn’t go too indepth, but it’s enough for a beginner to jump right in with a low learning curve in order to make something effective. I used the 10 minute program which I mentioned above. I found that I don’t really need the lead-up to the lower frequency and I would just get more out of it by just starting at the lower frequency to begin with, so I adjusted my program to do just that and added another 5 minutes so it. Kind of make it a relaxing power-nap meditation. It worked wonders, so extremely relaxing. I LOVE the low frequencies… lights and sound. Mixing the low frequency with the blue lights as well was a nice extra added touch to the program. That brings me to my next point… being able to control the lights that fire by using the audiostrobe colour presets while the programs are running is really nice. It really changes the entire program, which means that you not only get an entire host of programs on the 8gb card that comes with the machine (except the spectrastrobe stuff, because I believe it already is programmed to use the different LEDs separately), but you also get several variations through each of the presets which you can use with each program. This includes the programs you create using the basic editor. So you can make something and also have several variations on it as well. Very versatile. All in all, after using the Kasina for a week and a bit so far I’m really impressed with it. Some people have suggested elsewhere that it’s a mere entertainment machine… I can’t help but disagree with that completely. It’s built for the serious adventurer. If you’re honestly interested in giving your meditations a huge boost and if you’re seriously interested in giving your Astral Projections a kick in the rear, then I have absolutely no doubt that this machine will give you the non-physical focus you’re looking for. ESPECIALLY if you’re not interested or can’t spend a lot of money on a more expensive AVS machine. At $350 I don’t think you’ll find better quality or better value anywhere else. I will continue to provide updates on the different programs I use and the Kasina in general as I progress through it and get much deeper into the machine. I was checking out the Amazon App store the other day, because it JUST became available in Canada. I came across this little app called Relax Melodies. Essentially, it’s a white noise generator. It provides you with a selection of many different kind of “sounds” which you can then mix and combine to create the perfect white noise for you. I’ve been messing with it today and it’s a great little app. You can also find it on the Google Play appstore. And from the Amazon Appstore, if you prefer that. 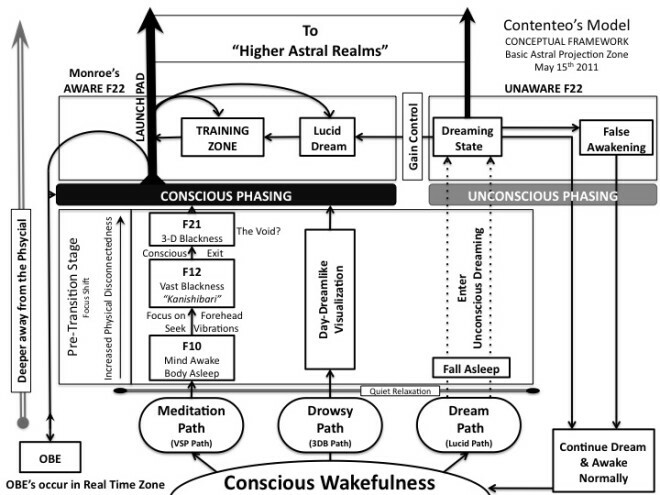 Conceptual Model of Consciousness by Contenteo! Contenteo (Astral Pulse Profile), a member of the Astral Pulse created this excellent Conceptual Drawing of Consciousness and, with his permission, I wish to share it here. As you can see, it goes from the bottom up and incorporates all of the different concepts into showing how they’re all connected and how they’re all just varying levels of awareness. Great job by Contenteo! If you wish to contact him you can leave a comment here, or through his Astral Pulse profile (link is above) or at rcarbone@stetson.edu. I’ve moved channels slightly though. I found this link on the Astral Pulse one day, I can’t seem to find the original posting of it anymore though… I’m glad that I bookmarked it. The story behind the recording: A beloved friend of the Dalai Lama, another monk, was making his transition from this life to the next. Not, it might be said, as a trauma or a lost cause, but as a joyful journey at the correct time and with understanding of life beyond earth life. The Dalai Lama sat at his friend’s bedside and chanted this chant for hours until the monk,with joy and peace, made his crossing. Those who were present begged the Dalai Lama to record the chant so that it might be shared with the world. He agreed to do so only if it was stated that the recording could never be sold, but only given away. This MP3 is the result. It is not for sale but is meant to be copied and shared. This is one of the most sacred and powerful mantras used for healing. It has truly wondrous therapeutic power when chanted or listened to regularly. Mrityunjaya mantra will help you to know the divinity within. It is chanted to know eternity. The mrityunjaya mantra is considered one of the maha mantras or great Sanskrit mantras because of its potency to give protection and manifold blessings. Maha mrityunjaya literally means the great victory over death. It is associated with Shiva, the destroyer of ignorance, and the liberator from the cycle of death and rebirth. It is therefore a life giving mantra that not only protects the physical body and gives health, but purifies the mind at a deep level.